The old version 2.4 (left) and the new version 2.5 depicting an unaberrated star. Notice that the version on the left is showing far more and brighter diffraction rings. 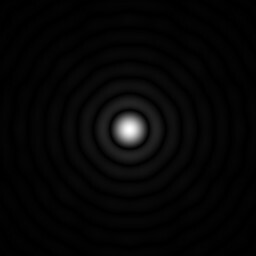 Intensity in 2.4 was scaled using a square-root function (pixel-value = intensity 0.5 ). The new 2.5 uses a special gamma-function. The function uses (next to intensity) two inputs, gamma and slope. At low intensities (depending on gamma and slope) a linear relation (slope*intensity) is used and at higher intensities a power relation is used (intensity gamma). The current standard setting for gamma is 0.45 with slope 4.5.